The Silliest Stories Out of Bustleburg by Jimmy Misfit is now available! The Simpsons’ Springfield may be horrible, but here’s an invitation to explore a far more dreadful community. 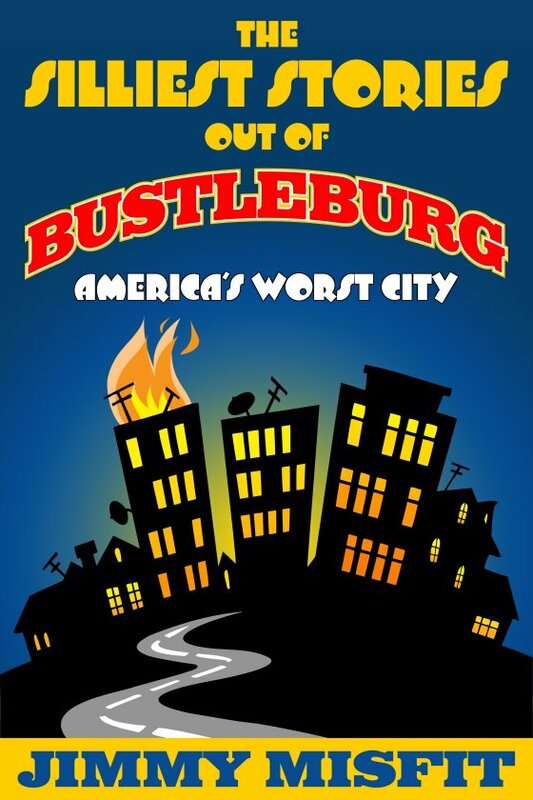 Welcome to Bustleburg, a dying American metropolis where the mayor has stolen the last eleven elections and polluting vampire industrialists hope to blot out the sun. The local televangelist takes credit for hurricanes through his prayer attacks, a media giant that never tells the truth just bought the TV station, and with the fire department on strike, blazes are everywhere. Prominent citizens of Bustleburg include mafia don Boss Vostic, who buries his victims in the only part of town where trees are legal, ditzy social climber Mauve Mertz whose fashion fiasco might get her exiled, and Queen Zina, the mystical wife of the mayor and possibly the source of all the city’s woes. You’ll never enjoy misery so much as your visit to Bustleburg.